The 2017 College Football season is starting this weekend and that means it is time to finish up predictions for the upcoming season. Despite what Nick Saban says about predictions, they are fun to make and see how they play out over an entire season. We will do something different than last year. In 2016, we made 5 predictions for each conference for a total of 55 predictions. The final total was 30.5 predictions correct for 55.5% hit rate. This is the fifth edition and we will finish predicting the Power 5 Conferences. Below is the schedule for the 25 predictions. 5. (SEC) A 2nd year head coach will win the SEC East – To be clear, this prediction is referring to a coach in his second year at his current school. Three coaches actually fall under this one with Kirby Smart at Georgia, Will Muschamp at South Carolina, and Barry Odom at Missouri. We mentioned Missouri in our last article (we really like their offense going into 2017) so our main focus will be on Georgia and South Carolina. Georgia went 8-5 last year in Smart’s first season. This year he is armed with seven starters back on offense and 10 on defense. One would expect improvements on both sides of the ball, but more so on defense given Smart’s background. The Bulldogs gave up 24 points and 327 yards per game, which is respectable, but another step forward would make them an even tougher opponent. It is very difficult to see this group getting worse. On offense, Georgia has Jacob Eason (2,430 yards with 16 touchdowns and 8 interceptions) back at quarterback. Also returning are Nick Chubb (1,130 yards and 8 TDs) and Sony Michel (840 yards and 4 TDs) to form a formidable backfield duo. The offense put up 24.5 points and 385 yards per game in 2016 and those numbers are likely to climb this season. The key is the schedule and Georgia’s toughest games are versus Tennessee (away), Florida (in Jacksonville), South Carolina (home), and Auburn (away). Yes, three games are away from home, but this team can win all of those and claim the East. South Carolina is interesting heading into 2017. Muschamp has been around the SEC a long time and his second season in charge at Florida resulted in his best result with the Gators. They went 11-2 overall and 7-1 in the SEC as Florida tied Georgia for the SEC East crown, but lost the head-to-head matchup to the Bulldogs. Things went downhill quickly for the Gators after that season, but one thing that remained was a very good defense. Like Smart at Georgia, Muschamp has a strong defensive background. South Carolina allowed 26.5 points and 412 yards per game in his first season. Six starters return on that side of the ball and a step forward is expected from this unit. On offense, the Gamecocks put up 20.8 points and 348 yards per game in 2016 with a quarterback carousel. 2017 sees 10 starters return including sophomore quarterback Jake Bentley (1,420 yards with 9 TDs and 4 interceptions after playing only 7 games). The top two running backs and top five receivers return, which should mean a vast improve in the performance of the offense. Of course, the big concern is if the offense does improve given some of the struggles Muschamp had at times in Gainesville. South Carolina’s toughest SEC games are against Texas A&M (away), Arkansas (home), Tennessee (away), Georgia (away), and Florida (home). They too can win both games versus West opponents and a 2-1 split of the other games would go a long way to being the surprise in the East. Both Georgia and South Carolina are set up for big moves in 2017 though Georgia looks a bit more ready to make the jump thanks to their offense. However, sometimes an excellent defense can carry a team, which may be what South Carolina needs in 2017. 4. (SEC) Auburn will win the SEC West – Let’s start by saying that Alabama is the team to beat in the West and entire SEC, but why make a prediction like that? We take a shot with the Auburn Tigers. On offense, Auburn returns 8 starters though one of them will not be at quarterback. That will go to Baylor transfer Jarrett Stidham who won the starting role earlier this month. He will have the luxury of Kamryn Pettway (1,224 yards and 7 TDs) and Kerryon Johnson (895 yards and 11 TDs) to run the ball. The passing attack should improve on the numbers of the last two seasons of 169 yards per game in 2016 and 174 yards per game in 2015. Stidham give this offense a boost and makes them even more potent. The defense returns 7 starters from a unit that allowed 17.1 points and 362 yards per game. The top three tacklers and six of the top seven tacklers return to lead the defense. Keep in mind that 2016 was only the first year under defensive coordinator Kevin Steele. In theory, the second season should be even better if the schemes are truly cemented into the players’ heads. Overall, this unit should allow similar numbers to the 2016 squad. As usual in the SEC West, the schedule is tough with three straight road games at LSU, Arkansas, and Texas A&M. There is a bye between the Razorbacks and Aggies, but that is still a brutal stretch when you consider that Georgia comes to town after the game versus Texas A&M. The final game is the Iron Bowl against Alabama and that comes at home, which should help the Tigers. It will be difficult for Auburn to defeat Alabama as well as win the West, but the Tigers are more than capable of doing both. 3. 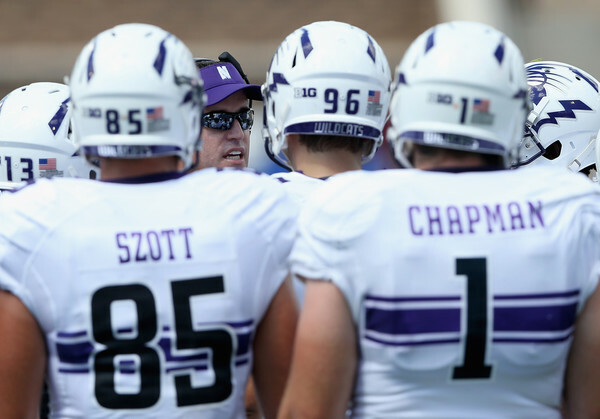 (Big 10) Northwestern will win at least 9 games – 2017 will mark the 12th season of Pat Fitzgerald in charge at Northwestern. In that time he has posted three seasons of nine or more wins (two of those were 10 win seasons). This year’s squad is loaded to give the Wildcats a shot at one of their big 9+ win seasons. The offense will rely heavily on Justin Jackson and rightfully so. Jackson has 4,129 yards rushing in his career, which is already second best in Northwestern history. A 1,500 yard season would put Jackson at #2 all time in the Big 10. Also returning with Jackson are 7 other starters including quarterback Clayton Thorson (3,182 yards with 22 TDs and 9 interceptions). Thorson has come a long way since his 2015 season when he struggled at times. He will be missing his top target from last year in Austin Carr (90 catches for 1,247 yards and 12 TDs). The one to watch out for in 2017 is Jalen Brown, a former Oregon Duck. The defense also returns 8 starters and this group did well in 2016 as they allowed 22.2 points and 404 yards per game. The front four and secondary return seven of the eight starters, which makes for a weaker linebacking group. Good thing they have a head coach in Fitzgerald who knows a thing or two about that position. In 2015 when Northwestern had 8 starters back they allowed 18.6 points and 319 yards per game. An improvement to those numbers in 2017 would make this team very dangerous. Northwestern opens with three games they should win: Nevada (home), Duke (away), and Bowling Green (home). After a bye week, the Cats face Wisconsin (away) and Penn State (home) to start Big 10 play. The rest of the Big 10 schedule could result in wins: Maryland (away), Iowa (home), Michigan State (home), Nebraska (away), Purdue (home), Minnesota (home), and Illinois (away). Nebraska is the toughest of those games especially away from home, but 9 or 10 wins is definitely realistic. 2. (Big 10) Michigan State will miss a second straight bowl game – Between 2013 and 2015, the Spartans won the Rose Bowl and played in two Cotton Bowls, winning one. Then 2016 happened when they slumped to 3-9 winning just one game in the Big 10. The defense allowed 27.8 points per game, the most under Mark Dantonio. 2017 sees four starters return on each side of the ball. Th offense loses quarterback Tyler O’Connor and top receiver RJ Shelton. LJ Scott does return after rushing for 994 yards and 6 TDs last year. Scott may burden a big load early in the season as new starters all over the field go through the learning curve. In 2016, the offense also had four returning starters and put up 24.1 points and 395 yards per game. The defense has four starters back from a group that allowed 27.8 points and 365 yards per game. The biggest concern is the defensive line that allowed 159 yards rushing per game in 2016 and have just one returning starter after off the field issues saw two others dismissed. Similar numbers are expected, but with Dantonio the defense could surprise to the good side. The schedule for the Spartans is filled with tough games. After a bye on September 16, they will face Notre Dame (home), Iowa (home), and Michigan (away) in three straight games. The end of October and beginning of November is another brutal stretch: Northwestern (away), Penn State (home), and Ohio State (away). The margin for error is small this year for Michigan State especially with the inexperience and off-season turmoil. We will be honest, 2018 looks like it could be an exceptional season for Michigan State. Assuming that all the 2017 non-senior starters return, there would be 20 starters back in 2018 (10 on each side of the ball). That could be a team to watch next season. 1. 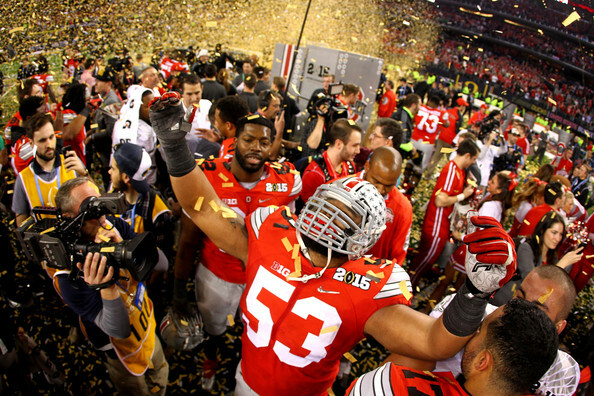 (Big 10) The Big 10 will win the National Championship – There are three main contenders to win the Big 10: Ohio State, Penn State, and Wisconsin. And as we saw in 2016, you do not need to win your conference to make the Playoffs. Ohio State had just 6 starters back in 2016 yet went 11-2 and made the Playoffs. Now they have 15 starters back and once again are the Big 10 favorites with all the firepower returning on offense an defense. Ohio State has three tough games in 2017: Oklahoma at in week two, Penn State at home at the end of October, and at Michigan to end the regular season. 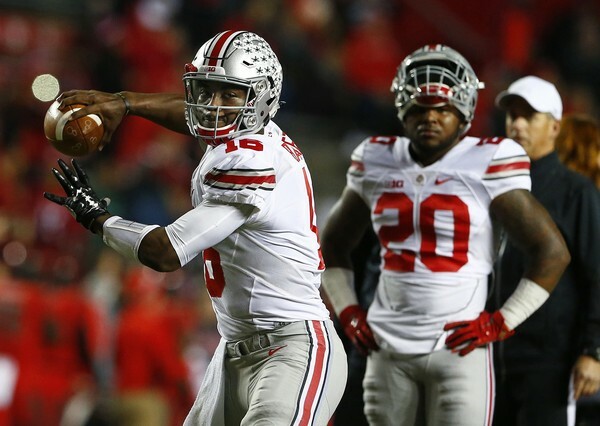 Expect the Buckeyes to be favored in all their games in 2017 barring some serious trouble. Penn State is another contender to win the Big 10 after their awesome 2016 season. They went 11-3 while winning the Big 10 and made numerous comebacks in the second half of games throughout the season. Trace McSorley and Saquon Barkley make a dangerous backfield combination that is up there with any other backfield QB/RB duo in the country. Just imagine how good the Nittany Lions might be if they decide to not spot their opponents points in the first half. Penn State has a brutal four game stretch over a five week span: Northwestern (away), Michigan (home), Ohio State (away), and Michigan State (away). The Spartans should not pose a serious threat, but given the game is after back-to-back games against the Wolverines and Buckeyes, there is the slight chance for a let down. The third top contender is Wisconsin, who has an incredibly friendly Big 10 schedule. They do face BYU on the road September 16 before a bye week. The Big 10 schedules opens with Northwestern at home and Nebraska on the road. In November, they welcome both Iowa and Michigan to Madison while playing Minnesota in the finale. The Badgers have a good shot of going undefeated where they will probably meet up with either Ohio State or Penn State. There are two dark horse contenders in Michigan and Northwestern. We discussed the Wildcats two predictions above and concede that they are a very long shot to even reach the Big 10 title game. 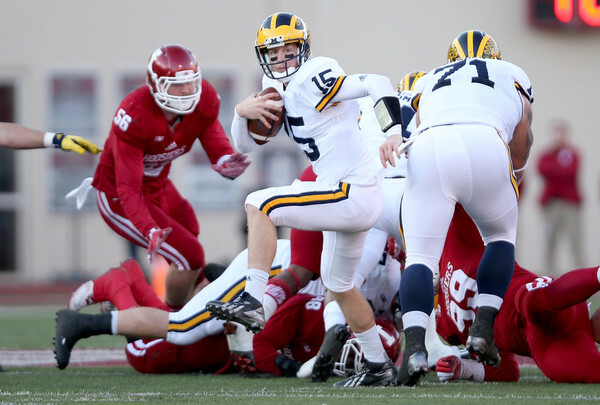 Michigan will be in year three under Jim Harbaugh, but the losses are severe. Just four starters are back on offense and only one starter returns on defense. They have a brutal schedule of Florida (in Arlington, Texas), Penn State (away), Wisconsin (away), and Ohio State (home). The Wolverines are capable of getting to the Big 10 Championship and even the Playoffs, but it does not look likely in 2017. It it tough to project the four teams in the College Football due to the multitude of matchup possibilities. Ohio State is probably the best of the trio mentioned above and loom as the Big 10’s best chance to win the National Championship. 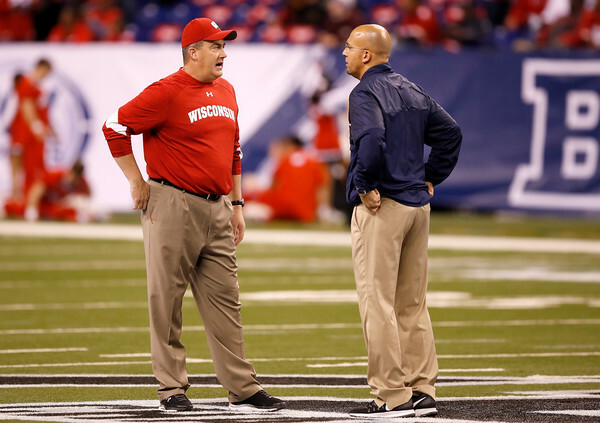 However, do not underestimate Penn State or Wisconsin from reaching the Playoffs where anything can happen. That concludes our 25 predictions for the 2017 season, however, we will give one bonus prediction below. Bonus: At least 10 FCS teams will defeat FBS teams – Does it seem like FCS teams upsetting FBS teams is happening more often? If so, that is because it is happening more often. Between 2004 and 2009, FCS teams averaged 4.3 wins per year against FBS teams with a high of 9 in 2007. Since 2010, that average has more than doubled to an average of 9.6 wins per season. 2013 saw the most FCS upsets with 16 and each of the last five seasons have produced at least 8 FCS wins against the FBS. Here is a link to all the FCS versus FBS matchups in 2017. There are 98 matchups featuring FCS against FBS teams, which means roughly 10% of the games will require an upset for this prediction to be correct. With FCS teams becoming more and more competitive, it makes sense they would defeat FBS teams more often. Let’s hope that is the case in 2017 as well. You have reached the end of our predictions. We hope you enjoyed reading them and hope you follow along to see how they turn out for the 2017 season. Enjoy the start of the 2017 season!